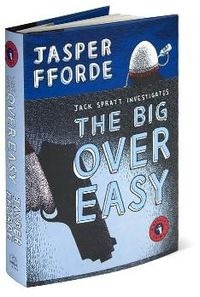 No one will ever accuse Jasper Fforde of being unoriginal. His Thursday Next Chronicles were some of the most unique story concepts I have ever read: Thursday Next is a literary detective, thrown into the plots of books to investigate crimes against literature. She chases mastermind criminals bent on destroying the classic works of fiction from book to book, dropping allusions to books I may or may not have ever heard about, and making minor characters in other books into major criminals. The premise is so well done, that I found myself wanting to go back and read some of those other stories to see what really happened. The Big Over Easy is a slight deviation from the Thursday Next Chronicles. In this book, we follow Detective Jack Spratt, and his new assistant, Mary Mary, as they investigate a particularly baffling case of an egg that has fallen off a wall. It could be an accident (the egg was drunk at the time). It could be suicide (this egg was depressed, they say). Or it could be murder. This egg, Humperdinck Jehoshaphat van Dumpty, aka Humpty Dumpty, or Hump to the numerous women who vied for his affections, had a lot of problems. It’s up to the motley crew of detectives from the Nursery Crimes Division of Reading’s police force to solve the case. Jack Spratt has a reputation to rebuild after failing to get a conviction against three little swine from maiming a wolf with a misunderstood reputation. Mary Mary wants nothing more than to move up and out of the NCD to work with more highly regarded detectives, and she’ll do what it takes to make sure that happens. Working on Nursery Crimes is not glamorous work. Jack thinks it should be. Mary just wants to move on. This crime will make or break the NCD, and with it, both their reputations. Along the way, we meet alien detectives who speak only binary, encounter Georgio Porgio, the villainous mobster, and a host of other characters who are nothing like the ones you remember from the stories of your childhood. Your parents and your teachers only told you part of the story. These Nursery Rhyme characters are a lot more complicated than you ever knew. The Big Over Easy is filled with wonderful backhanded mentions of the classic rhymes from our childhood. I’m sure that on the first read I missed half of them. Since I have two young children, and we used to read some of these stories to them before bed, I am a little more familiar with them than I was five years ago. But when I read them, I never would have thought to turn them into something like this book. Fforde has done a wonderful job of turning them into a mystery that is genuinely intriguing, laugh out loud funny, and hard to put down. Jasper Fforde is truly one of the unique story tellers of our time, and should be required reading for every author who thinks all the stories have been done. The Big Over Easy is, if you can keep an open mind, a great place to start reading his collection. I highly recommend it.